If you've ever experienced frustration when crocheting with eyelash yarn, you'll appreciate these tips and tricks for working with it. When you are crocheting with eyelash yarn, you definitely don't want to use a hook that is too small for the job. Larger hooks are better for enabling you to see the stitches. Even if the core of the yarn looks thin, think of the eyelash yarn like a bulky yarn when you choose the hook you're going to use. Remember that you can crochet holding two different yarns together. In this case, choose one eyelash yarn and one smooth yarn. The additional smooth yarn will enable you to see your stitches more clearly. Make sure to choose a big enough crochet hook to accommodate both yarns. To see an example of this technique, take a look at this free scarf pattern. The scarf combines Lion Brand Fun Fur with Caron Simply Soft. The finished scarf has the furry appearance characteristic of eyelash yarn projects. In this project, a size P 11.50 mm crochet hook is suggested. Choose a stitch pattern that allows you to crochet into spaces. It's a lot easier to find a space under all that "fur" than it is to find a stitch. This V-stitch in brick repeat is a good one to try with eyelash yarn. If you'd like to crochet a project using that stitch, the Fancy Fur Scarf pattern might interest you. The basic granny square is another pattern that works well with eyelash yarn because when you are working it, you can always crochet into spaces rather than stitches. When you crochet with eyelash yarn, it's sometimes a bit of a challenge to see your stitches. They tend to get lost under all that fiber. If you lose track of your stitch count, don't panic. Believe it or not, there is a way to count how many stitches and rows you have. The trick is holding the work up to a light source. A sunny window is ideal for this. With the sun shining through your project, you should then be able to count your stitches. If the sun isn't shining, try holding the work in front of a bright lamp, which might also do the trick. Hopefully, these tips will put the fun back into working with furry fun yarn. If you have projects in mind, you can look forward to the final product to help you get through the frustration of working with it. Here are free patterns to inspire you. There are several different patterns for scarves, including striped and checkered scarves. 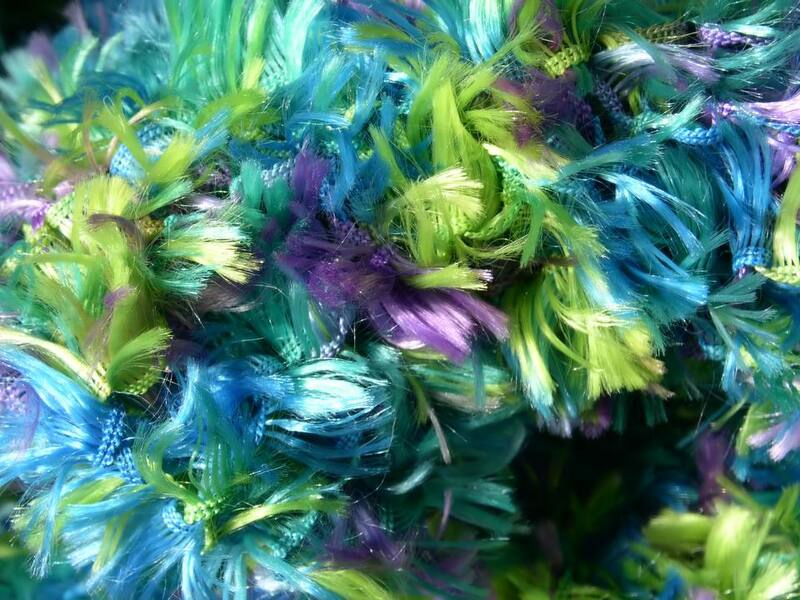 But you can also think beyond scarves to using eyelash yarn to create details for other patterns. These include adding fur to baby boots, Christmas stockings, and animal crochet patterns. You can even add some faux fur to doll dresses.